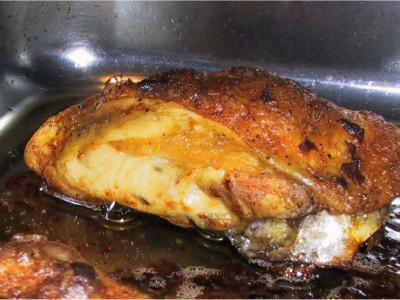 This is a recipe for incredibly tasty and crisp roast chicken - and it's very easy and fast. Total preparation time is just an hour. 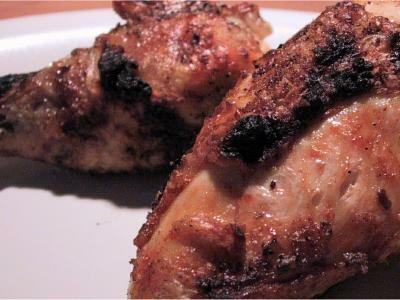 It's the covering of the chicken pieces with butter that makes this chicken so incredibly crispy and tasty. Instead of roasting the chicken in the oven, you can also barbecue it - but be careful that the dripping butter doesn't start flames. Extinguish any flames on the charcoal immediately (best with beer). 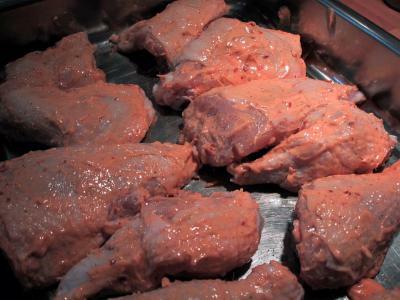 Please buy decent meat - a cheap supermarket chicken tastes terrible and is also incredibly cruel to the chicken. Get something free-range, it is well worth the money as it tastes so much better! As this web site can calculate ingredient amounts for both Metric and US visitors and for any amount of persons, some measures may appear a bit odd at times. We do round and try to be as clever as we can with the calculations... If you have any ideas on improving this system, we would like your comments on our contact page. Pre-heat the oven to 200 degrees Celsius / 400 Fahrenheit / Gas Mark 6. Best with roast vegetables and a salad. 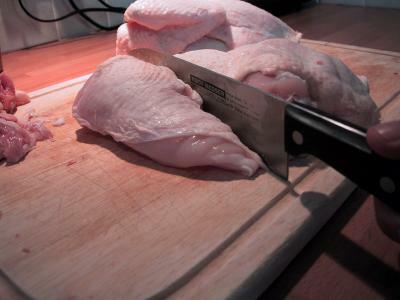 Take out the fatty bits from inside the chicken. Cut off the "pope's nose". 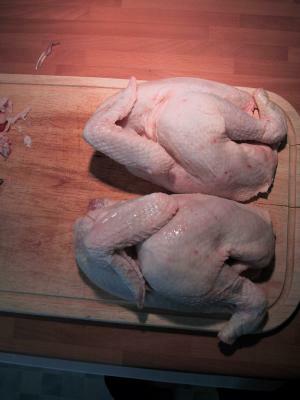 Cut chicken in half along the back first. You need a decent knife for this. 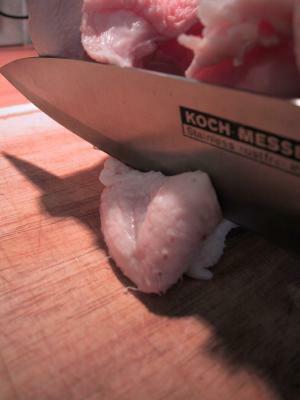 Then cut in half along the breast from the inside. If you have a good aim and a cleaver, use that. If you have a bad aim, don't, as you will end up with lots of bone splinters. 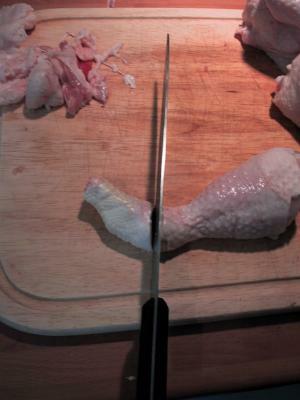 then cut off the leg - try to cut through the middle of the joint. Take off the bottom bit of the leg - you probably aren't too keen on eating that bit anyway. 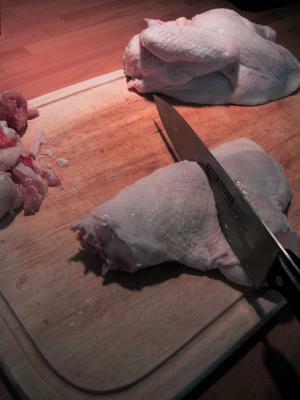 Now cut off the remainder of the wing with a bit of breast. 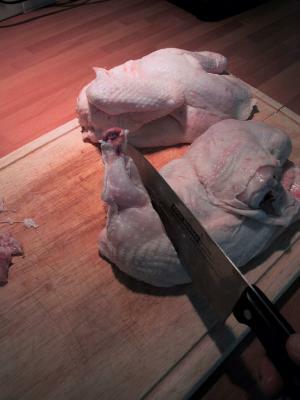 Then cut off the breast. 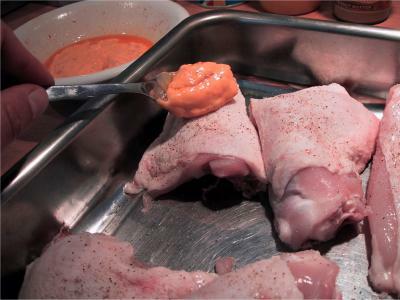 Cut the rest in half - then repeat this with the other half of the chicken. And that's that - 12 lovely chicken bits. 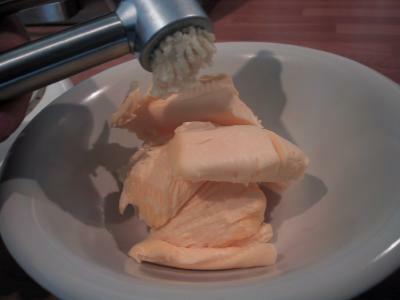 Put your butter into a dish and press the garlic onto the butter. 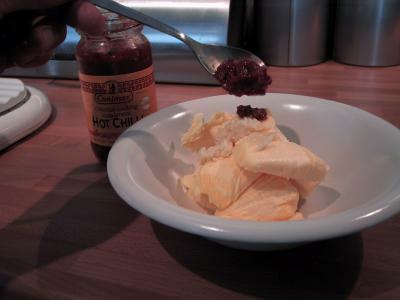 Add the hot chilli paste. If you butter is cold from the fridge, you can put the dish into the oven for a minute and then proceed. 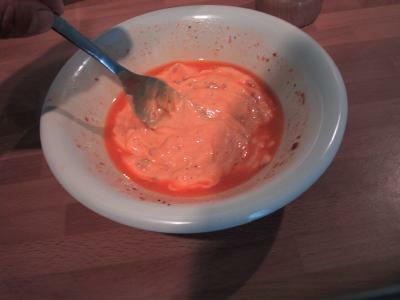 mix the butter and the spices until it is creamy and slightly liquid. 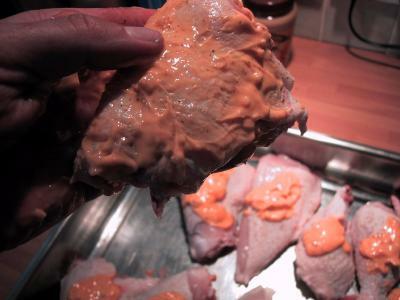 Put some of the butter mixture on each chicken piece - distribute evenly. 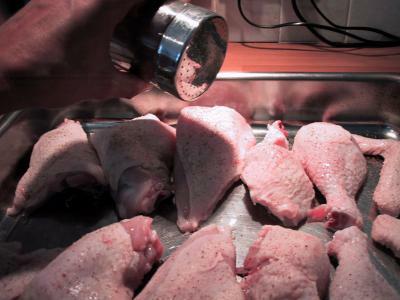 Now rub it into the chicken pieces with your hands. Make sure all sides are well covered. 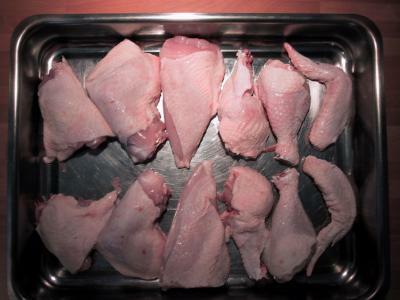 Time to put our tray with the chicken pieces into the oven for 45 to 50 minutes. Please leave some feedback by rating this page (1=worst 10=best)! 10 Get an expert academic writing assistance! We can write any paper on any subject within the tightest deadline. 10 Very interesting website i have bookmarked step-by-step-cook.co.uk for future reference. 10 Why there is so lot of spam on your website?! Where is exit?! 8 I don't want to use butter..
10 IT WAS REALLY A GOOD RECIPE!